In stock -This product will ship today if ordered within the next 10 hours and 14 minutes. 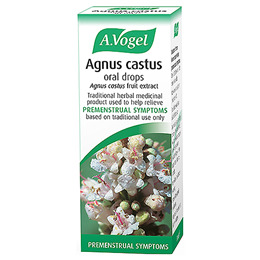 A Vogel Agnus Castus is a Licensed herbal remedy which can be used to help relieve symptoms of PMS (premenstrual syndrome) such as menstrual cramps, breast tenderness, bloating and irritability. It comes in the form of a tincture (liquid drops) and contains the extract of the fruit from the Agnus castus plant. Each 20 drop dose of A.Vogel Agnus castus provides you with over 500mg of extract. Tincture (from Agnus Castus Fruits), Extraction Solvent: Ethanol 69.5% V/V. Women experiencing premenstrual symptoms: 15 to 20 drops in a little water twice daily. Taking the maximum daily dose, you get 1,000 mg of Agnus castus extract, equivalent to 100mg dried berries. The effects of this product may not be felt immediately. For best results you may need to take this product for up to 3 months. Do not take more than 40 drops a day. Not for use in children or those under 18 years of age. Do not use if you have a pituitary gland disorder, are pregnant, trying to become pregnant or breast-feeding. See your doctor before taking any form of Agnus castus if you are suffering from an oestrogen-sensitive cancer, have suffered from a pituitary disorder or are taking dopamine agonists, or antagonists, oestrogens or anti-oestrogens. This product may be harmful for people suffering with alcoholism. Below are reviews of A Vogel Agnus Castus - Oral Drops - Premenstrual - 50ml by bodykind customers. If you have tried this product we'd love to hear what you think so please leave a review. This product relieved PMS, especially breast tenderness. Also, be aware that it might extend your cycle, mine didn’t start on time when using this product. Overall good, but taste not the best, very herbal and you can taste ethanol. Really helps easing of monthly cycle symptoms including avoiding breakouts. A Vogel Agnus Castus is a Licensed herbal remedy which can be used to help relieve symptoms of PMS (premenstrual syndrome) such as menstrual cramps, breast tenderness, bloating, irritability and mood swings. We are registered with the Medicines and Healthcare products Regulatory Agency (MHRA). The MHRA ensure anyone selling medicines to the public via a website is doing so legally.